Potassium Sulphate is a water soluble, non-crystalline inflammable salt that is also known by the name sulphate of potash. Potassium sulphates are used in agrochemical industry to manufacture fertilizers that provide both sulphur and potash to the crops. Arcanite is the mineral form of potassium sulphate which is rarely found in the environment. Potassium sulphate can be produced by the reaction of potassium chloride with sulfuric acid analogous to the Leblanc process. The crude form of potassium sulphate salt is used in the manufacturing of glass. Potassium sulphate has an orthorhombic crystal structure with 174.25 g/mol molar mass. Potassium sulphate is used in pharmaceutical industry for growth, repair of damaged tissues and various other uses. As compared to other potash fertilizers, potassium sulphate has low chloride content and lower slat index. The key sources for potassium sulphate are generally found in combination, these combinations include other mineral sulphates for instance, sodium, calcium and magnesium. Potassium sulphate market is anticipated to record a significant CAGR of 4.6% over the forecast period. The potassium sulphate market is estimated to value at USD 153 million at the end of the forecast period. Many multi-national companies are concentrating towards new product advances using potassium sulphate. Moreover, the many advantageous properties of potassium sulphate are exploited in the field of agriculture and pharmaceuticals. New uses for potassium sulphate derivatives have been discovered which is expected to drive the potassium sulphate market rapidly. Currently the global potassium sulphate market is observing vibrant growth owing to increasing demand of multi mineral fertilizers in the market. Advances in agricultural industry in the past few years and growing agricultural innovation explorations are projected to drive potassium sulphate market besides the wide range of functions of potassium sulphate in an immense range of products such as fertilizers, food nutrient supplements, and cosmetic thickeners during the forecast period.On the basis of regional platform, global Potassium Sulphate market is segmented into five major regions including North America, Europe, Asia Pacific, Latin America and Middle East & Africa region. The rising demand for potassium sulphate and its by-products for various processes in pharmaceutical, agrochemical, cosmetic, food industries are expected to drive the market rapid over the forecast period. Application of potassium sulphate in the beauty industry in hair care formulas, makeup products and moisturizers. Use of potassium sulphate has received GRAS rating and FDA approval in food industry as nutrient supplements which is expected to contribute significantly in the growth of the potassium sulphate market across the globe. 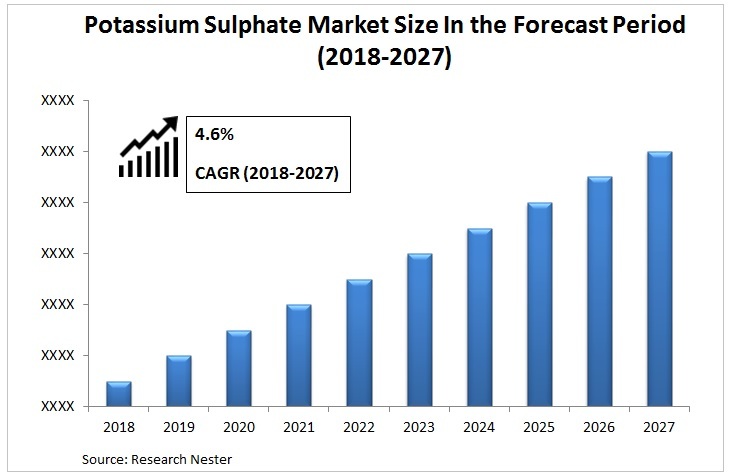 Rapid economic development with a thriving manufacturing sector is expected to boost the potassium sulphate market even more in the developing regions. Potassium sulphate is used in combination therapies in the pharmaceutical industry which is expected to back the potassium sulphate market decently in its growth. The use of potassium sulphate gives disease resistance to plants by stimulating the growth of a strong stem and thicker outer cell wall which makes them an attractive choice to be used for fertilizers that is estimated to propel the market most sharply over the forecast period. However, various health problems associated with increased ingestion of potassium sulphate such as nausea, vomiting, diarrhea, sore throat and more are anticipated to serve as a restraining factor in the growth of potassium sulphate market. Proper dosing and usage of potassium sulphate is thus, recommended.